Brad McCracken has been a member of the Accent Music community for years - first as a young student, and now as a teacher for over 13 years! 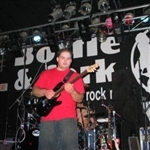 He has experienced playing out and toured the East coast with the cover band "Hyjinx". His influences include Richie Kotzen, Joe Satriani and Eric Johnson, to name a few. Well-versed in country, rock and acoustic guitar, Brad is able to cater lessons to the interest and musical-preferences of beginning or intermediate-level students. He accepts students ages 7 and up and charges $28/half hour payable monthly.